Sri Mahadeva Temple located at a distance of 22 kms from Kochi, is on the banks of the Periyar river, also known as Dakshina Ganga. The temple is only about one km from the famous Marthanda Varma Bridge in Alwaye. Dedicated to Lord Shiva, it is best known as the centre for the Shivarathri celebrations. Devotees from all over Kerala flock to the temple to perform Bali (sacrifice), a religious ritual to honor their ancestors. The temple is one of the 108 Shivalayas of India. Many legends are assoicated with this temple. Among the famous one is, once a Shivalingam was installed by Lord Parasurama here but it was destroyed by flood. Lord Shiva told him that he does not want a temple structure for protecting the Lingam. Another one is that bhuthaganas of Lord Shiva worshipped the Shivalingam every night and they decided to construct a temple at this site. Lord Shiva offered the condition that the temple must complete in a single night, but they failed. It is also believed that Lord Rama, during his search for Sita, performed penance for Jadayu at this site. History states that Vilwamangalam Swamiyar, a great brahmin saint along with his companions constructed the temple again, but it was destroyed by flood in 1343. So the they were decided to construct a small temple on the bank of the river in order to perform poojas during monsoon season. This temple is now known as Bala Kshetram. It is a fact that though unfinished in nature, this temple has withstood many a flood and still stands as an enigma to the architects, regarding its foundation and structure. The Travancore Devaswom Board authorities tried to construct a temple here some years ago but the Deva Prasna conducted and revealed that constructon of the temple is against Lord Shiva's wish. The presiding deity Lord Shiva is facing the east. The unique feature of this temple is that the Shiva Linga (the symbolic idol of Lord Shiva) is not enclosed in a shrine but is installed on the sand banks. 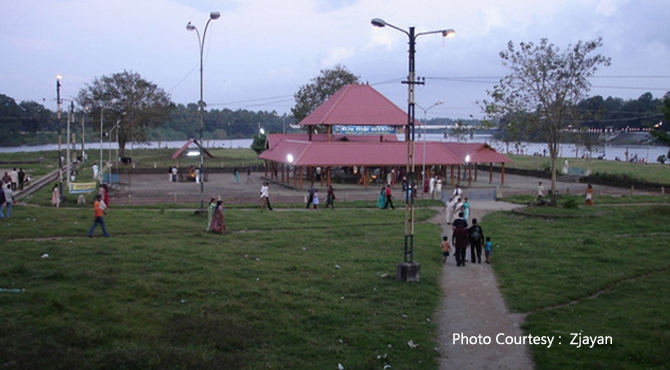 This place is called the Aluva Manal Puram (land with sand). It is believed that the Shivlinga has risen out from the sand on the bank of the river. During the monsoon season, the whole region gets flooded and the idol gets submerged in water. At that time, worship is done in a small shrine on the upper banks of the river. The most important festival of Aluva temple is the Maha Shivarathry in Kumbham (February-March). The Shivarathry festival is a colourful celebration and devotees stay away the whole night in prayer and pay homage to their ancestors. People belonging to all classes, castes and creeds assemble for this festival, some for worship, some for merchandise and some for sightseeing. Aluva Shivaratri celebration, which is held in the temple premises is more a ritual than a festival, during which one pay homage to their forefathers (pithrutharpanam). On this occasion known as 'Karkidaka vavu bali', thousands of devotees come to Aluva Manalpuram (river bank) from different parts of the state. They stay awake the whole night in prayer. The rituals got off to a start as early as 3 a.m. on the day with the performance of a Ganapathi homam in the Siva temple here followed by other special poojas including Mruthyunjayam, Thilahavanam, Dhara and Namaskaram. A dip in the river at the 'Brahmamuhurtha' (3 am) after observing the rituals of Shivarathri is considered very sacred. A month long trade fair is also conducted along with the festival. Daily Ezhunnallippu of the deity atop a caparisoned elephant, a procession known as Dikvijayam is conducted on the third and fourth days, and pallivetta ceremony on the fifth day. The festival concludes with the Aarattu on the next day of Shivarathry. The ceremonies in the temple continued up to 11 a.m. and the offerings were distributed subsequently. Nearly 200 priests assisted the devotees who performed the rituals at about 150 'balitharas' set up for the ceremonies. As per the rituals of the temple, the Shivalingam is served with athazha pooja on a single day while nivedyam is offered everyday. Here, Neivedyam is offered in Arecanut leaves only. Rudrabhishekham and Dhara are the prime offerings to the deity. There is a Nandi prathishta infront of the temple. There is only one pooja daily. From Makaram 1 to Medam 1 only athazha pooja is performed and on other days only nivedyam is offered. There is an Ayyappa temple near the Temple. The Aluva Sree Krishna - Balarama temple, Aluva Adwaitha Ashramam and Aluva palace are situated on the opposite bank of Mahadeva temple. Aluva Mahadeva Temple is managed by Travancore Devaswom Board.